You can save time and energy by cooking a ribeye roast in a convection oven. Professional chefs have used convection ovens to prepare roasts for many years, but you can now get a smaller sized convection oven for home use. The allure of cooking with a convection oven is that it circulates hot air throughout the oven, cooking your ribeye roast evenly in a shorter time using less energy. You prepare a ribeye roast for cooking in a convection oven in the same manner as you would a conventional oven. You simply need to make a few adjustments to cooking temperature and time. Select a 4 lb. to 6 lb. ribeye roast. "For a tender cut of beef," according to "The Joy of Cooking." choose a ribeye roast labeled "Choice" -- the highest grade of beef available in most supermarkets. Check the expiration date on the label, and don't purchase a roast that is past that date. The beef should have a deep red color and no foul odor. Refrigerate your roast if you're not cooking it immediately. The U.S. Department of Agriculture says that fresh beef can be kept in the refrigerator for three to five days at 40 degrees Fahrenheit. It can be stored in the freezer for up to a year at 0 degrees Fahrenheit and defrosted in the refrigerator when you're ready top use it. Preheat the convection oven to 325 degrees Fahrenheit for 15 minutes. Position the oven rack in the middle. For a combination microwave-convection oven, place a rack in the ceramic tray. Prepare the rib-eye roast for cooking. Trim any excess fat from the roast with a sharp knife. Rub the roast with salt and ground black pepper. Use other seasonings, such as rosemary, garlic and dry mustard, to your own taste. Place the seasoned rib-eye roast in a shallow roasting pan with the fat side up. Don't add any water or liquid to the pan. Insert an oven-proof meat thermometer into the roast at its center. Place the pan on the oven rack. Cook the rib-eye roast uncovered at high fan with the vents closed. Figure 10 to 20 minutes per pound for rare to medium doneness. Exact cooking time will depend on your oven; consult the owner's manual for specific instructions. Remove the rib-eye roast using pot holders when it is cooked to your liking. 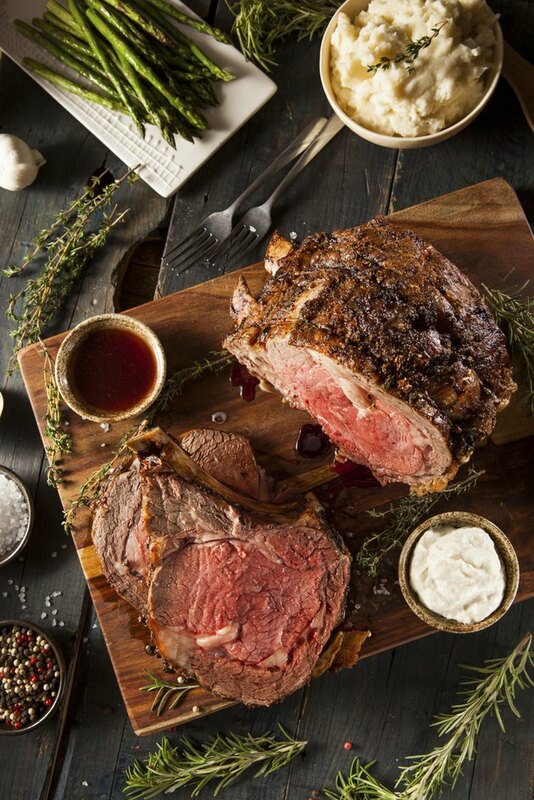 Food.com suggests removing the roast when the internal temperature reaches 135 degrees Fahrenheit for rare and 155 degrees Fahrenheit for medium. The temperature will rise another 5 degrees as the roast rests. Cover the roast loosely with aluminum foil and allow it to sit for 15 minutes before carving. Slice the roast and place on a platter for serving. You can also add vegetables, such as potatoes, sweet potatoes, onions and carrots to the roasting pan before cooking to prepare an entire meal at one time. If desired, prepare gravy using the pan drippings as you normally would.